where the 2000 classic "Memento" was filmed. The isolated spot where Leonard (Guy Pearce) kills Teddy (Joe Pantoliano), at the start of the film. This scene was filmed at the former Fletcher Oil Refinery, at 24721 S. Main Street, in Carson, CA. then it has been completely torn down and is now little more than a large vacant lot. In these images, the camera is looking northeast. Notice that to the left of the building, you can see the corner of another building. I blew up that image, and the lettering on the building reads "Kole Imports". Kole is located across the street from the refinery, at 24600 S. Main Street. Following one of his notes, Leonard goes to the City Grill cafe to meet with Natalie. He doesn't remember her, and walks right by her, but she remembers him. This is also where he first sees the big tattoo on his left forearm in the cafe's restroom. southeast corner of Wilson & Jackson Streets, a few blocks east of the Glendale Galleria. As Leonard drives up to the cafe, the camera is looking west down Wilson Ave.
(The church steeple seen in distance in that shot is the First Baptist church, at Wilson & Louise). merits of memory versus notes/facts. Leonard insists that memories can't be trusted. Leonard also confirms how much he wants revenge on the man who killed his wife. This was filmed at the Olympic Coffee Shop, at 12192 San Fernando Road, in Sylmar, CA. That's up in the northeast corner of the San Fernando Valley. As Leonard & Teddy run Dodd out of town, we see Leonard standing next to a chain link fence. at 2627 N. Hollywood Way, in Burbank, CA. ties him up, and takes his gun, before he & Teddy march Dodd down the stairs and run him out of town. This is actually the Hill Crest Inn motel, at 9111 Sepulveda Blvd, North Hills, CA. That's in the San Fernando Valley, just north of the northwest corner of Sepulveda & Nordoff. 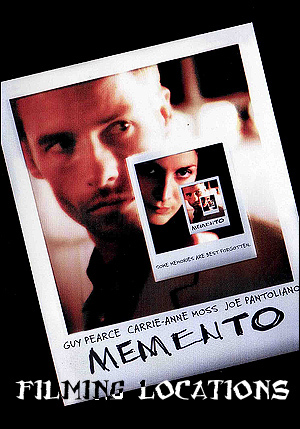 The photos on this page are stills from the DVD of "Memento"